A cement-based grout with a resistance to a broad spectrum of moulds and bacteria specifically designed for walls with 1-3mm joints. Suitable for interior applications. Commercial and domestic walls. 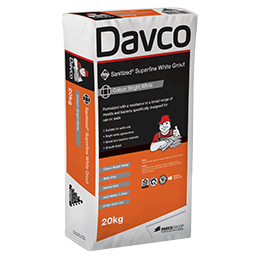 Truffle coloured cementitious grout designed for use with most types of ceramic tiles and natural stone applications available in a large range of colours. Suitable for interior and exterior applications. Commercial and domestic walls and floors. Cinnamon coloured cementitious grout designed for use with most types of ceramic tiles and natural stone applications available in a large range of colours. Suitable for interior and exterior applications. Commercial and domestic walls and floors. River Stone coloured cementitious grout designed for use with most types of ceramic tiles and natural stone applications available in a large range of colours. Suitable for interior and exterior applications. Commercial and domestic walls and floors. Gunmetal Grey coloured cementitious grout designed for use with most types of ceramic tiles and natural stone applications available in a large range of colours. Suitable for interior and exterior applications. Commercial and domestic walls and floors. Tumbleweed coloured cementitious grout designed for use with most types of ceramic tiles and natural stone applications available in a large range of colours. Suitable for interior and exterior applications. Commercial and domestic walls and floors. Tuscan Clay coloured cementitious grout designed for use with most types of ceramic tiles and natural stone applications available in a large range of colours. Suitable for interior and exterior applications. Commercial and domestic walls and floors. 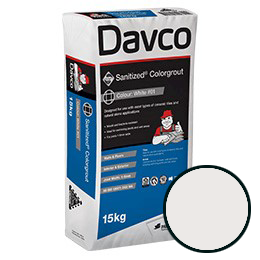 Bone coloured cementitious grout designed for use with most types of ceramic tiles and natural stone applications available in a large range of colours. Suitable for interior and exterior applications. Commercial and domestic walls and floors. Taupe coloured cementitious grout designed for use with most types of ceramic tiles and natural stone applications available in a large range of colours. Suitable for interior and exterior applications. Commercial and domestic walls and floors. Light Grey coloured cementitious grout designed for use with most types of ceramic tiles and natural stone applications available in a large range of colours. Suitable for interior and exterior applications. Commercial and domestic walls and floors.